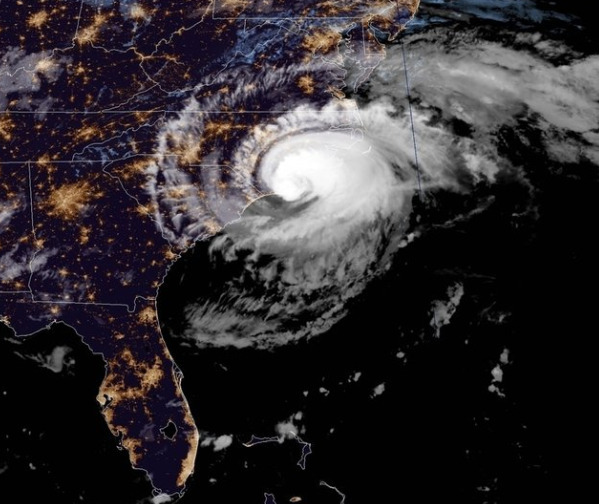 Now a Category 1 hurricane, Florence has made landfall east of Wilmington, NC, lashing coastal areas with near-100mph winds and knocking out power from nearly 300,000 homes. Wilmington International Airport is closed with no flights on Friday, while Charleston also tweeted there will be no operations until at least Saturday. The airports of Fayetteville, N.C, Jacksonville, N.C., Myrtle Beach, S.C., and New Bern, N.C are also closed. A State of Emergency is in effect in the Carolinas, Georgia, Virginia and Maryland. Waves 10ft hight crashed ashore in coastal communities even before the storm made landfall and forecasters warned of 'catastrophic' freshwater flooding on waterways miles inland from the Carolinas coastline. They say the sluggish speed of the storm could result in prolonged damage sustained over several days which could result in a huge amount of rainfall for some areas. Meteorologists think it could cause as much widespread flooding as in Houston last year. The National Hurricane Center warned of 'catastrophic flash flooding and prolonged significant river flooding'. "You're going to have flooding miles and miles inland," its director, Ken Graham, said early Friday. About 70 people had to be evacuated from a collapsing hotel near Jacksonville. Hurricane-force winds extended 80 miles from Florence's centre with beach hotspot Myrtle Beach battered by heavy winds and resembling a ghost town. "Surviving this storm will be a test of endurance, teamwork, common sense and patience." Gov. Roy Cooper warned.